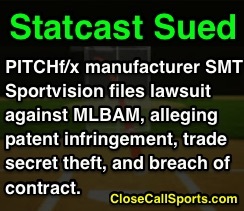 After MLB Advanced Media ejected Sportvision's PITCHf/x in favor of Statcast, SportsMedia Technology Corp (SMT) filed a lawsuit against MLBAM, alleging patent infringement, trade secret theft, and breach of contract related to Statcast and MLBAM's decision to replace Pitch f/x prior to the 2017 season in favor of newer and more refined pitch-tracking tech. Sportvision is a subsidiary of SMT. MLB traded PFX for Statcast in 2017. Specifically, SMT and Sportvision allege in a complaint that MLBAM willfully tried "stopping Sportvision from receiving any revenue" for PITCHf/x and instead installed an MLB system (Statcast's Trackman and PITCHcast) ahead of 2017, and several years before the SMT-MLBAM contract was to expire on December 31, 2019. In alleging that MLBAM breached its contract, SMT wrote that MLBAM "wanted to take the fruits of Sportvision's labors for MLBAM's benefit alone, and began a campaign to bring the PITCHf/x system in-house." For instance, SMT found that after Sportvision Vice President and General Manager of Baseball Ryan Zander left the company in 2016—just two hours after SMT acquired Sportvision—and was hired by MLBAM, it was Zander who allegedly told SMT that professional baseball would not longer require Sportvision's services. Zander is presently MLBAM's Vice President of Business Development. 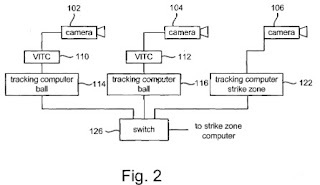 SMT wrote that Sportvision invented certain technology, including Strike Zone Rendering and Pitch Location Rendering, which were protected by patents, and that MLBAM's use of these and other PITCHf/x "trade secrets" in its Statcast program constituted infringement and trade secret theft, in addition to breach of contract. SMT alleges that MLBAM breached terms of exclusivity, performance (e.g., failing to fulfill its contractual and operational obligations to Sportvision), and willful misappropriation of Sportvision's trade secrets, including MLBAM's use of PITCHcast, a component of Statcast. MLBAM ejected SMT, which is now suing. 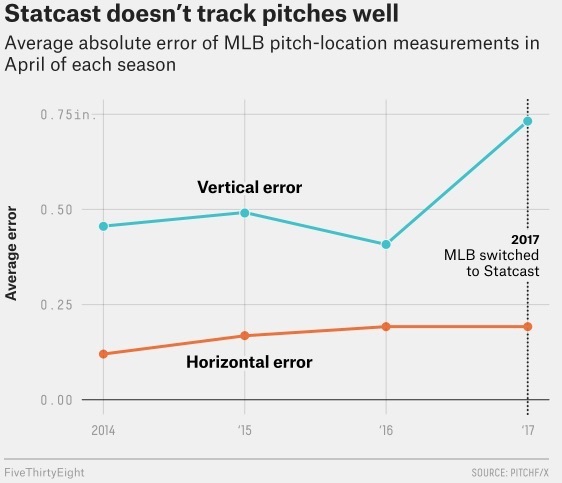 According to the complaint, MLBAM created a derivative product of PITCHf/x called PITCHcast by replacing core components of PITCHf/x with third party components from competitors Trackman and ChyronHego in alleged preparation for shutting Sportvision out of professional baseball's pitch tracking technology. Specific alleged incidents of infringement include At Bat VR (including MLB's At Bat mobile app), MLBAM's umpire evaluation app, and MLB.com pitch visualizations. Charged SMT, "MLBAM's Executive Leadership was so determined to stop Sportvision from receiving any revenue for the tracking and rendering of MLB pitches using a league-wide installed system that he became blind to the legal facts and legal reality of the situation." SMT alleges that MLBAM hired Zander to oversee the "MLBAM process of reverse engineering and misappropriating the Sportvision Intellectual Property and Trade Secrets in the PITCHf/x System," relying on his "intimate Trade Secret knowledge" of PITCHf/x in order to do so. The complaint states that Sportvision employees, including Zander, were required to sign a proprietary information, inventions, and non-solicitation agreement, that would have barred an employee from communicating trade secrets to a third-party or outside source. PITCHf/x-reported amount of tracking error. SMT also accused MLBAM of failing to perform several required acts, including funding the PITCHf/x budgets, paying for PITCHf/x expenses, hiring and paying for PITCHf/x equipment operators, providing Sportvision with access to stadiums and facilities, and providing Sportvision with access to the PITCHf/x master data. The complaint features juicy tidbits, such as, "Everyone knew that MLBAM's Executive Leadership and Sportvision's Executive Leadership hated each other. They had been at odds for years—in fact, there had been literal scream tests between the two of them right in [MLBAM's New York offices]." According to the suit, the greater issue of alleged nefariousness came to light in March 2018, when an SMT account manager inadvertently received a series of e-mails from MLBAM and a FoxSports associate discussing SMT competitors, including Doppler radar-centric TrackMan, and optical-tracking system ChyronHego. SMT's suit contends that MLBAM had tried to get out of its Sportvision relationship "for years" and that MLBAM attempted to make a legal argument that it had not "terminated" the PITCHf/x agreement/contract, even though MLBAM replaced PITCHf/x with Statcast prior to the 2017 season (the counterargument purportedly contends that PITCHf/x simply became PITCHcast, so in using Statcast, PITCHcast, previously-known-as PITCHf/x, still exists, even if, allegedly, MLBAM is not obligated to pay SMT because PITCHcast is a different product). History of Pitch Tracking Technology: The story begins at the turn of the century, when MLB merged the AL and NL umpiring staffs and, in doing so, attempted to unify and standardize its umpiring operation throughout the major leagues. QuesTec: As part of this process, Major League Baseball turned to a company called QuesTec, whose Umpire Information System (UIS) employed proprietary measurement technology and multiple cameras in the ballpark in order to track a pitched ball as it arrived at home plate, with CDs made available to home plate umpires for post-game strike zone analysis and training. UIS' reported margin of error was half-an-inch. At first, QuesTec appeared in a limited number of stadiums (four in 2001, the year of QuesTec's official debut), but installation gradually expanded to more parks. QuesTec's UIS was first on MLB's scene. In 2003, the World Umpires Association filed a grievance over the league's use of QuesTec, which still only appeared in a handful of venues. Among the problems with QuesTec were concerns about its ability to accurate track pitches and strike zone heights in the wake of confounding variables, such as excessive bat movement or lighting issues. In 2006, MLBAM and a new company, Sportvision, began work on new software—still with QuesTec as in-stadium hardware—designed to refine the raw data and standardize its distribution to umpires. Of significant note, MLBAM and Sportvision partnered to develop a pitch-tracking tool for MLB.com—what would eventually be known as MLB Gameday, which pieced together the ball's trajectory based upon as many as 20 captures from pitcher release through the ball's arrival at home plate. In the end, only 11 stadiums featured QuesTec, and the difference in called strike percentage between stadiums with QuesTec and stadiums without QuesTec amounted to 0.3% (less than three pitches per game). Pitch f/x: In 2009, MLB turned to Sportvision's Pitch f/x technology and UIS-equivalent, called Zone Evaluation, for its umpire analysis. The new program's hook was that its performance review would be quicker and more accurate than QuesTec, though, curiously, whereas QuesTec reported a 0.5-inch margin of error, Sportvision reported a 1.0-inch margin of error with its Pitch f/x system. 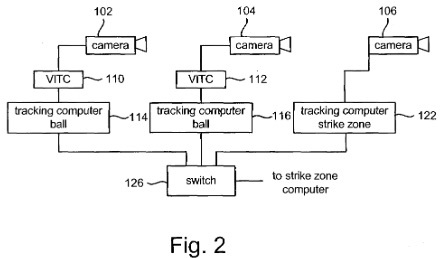 Virtual strike zone patent assigned to Sportvision Tech Corp. Nonetheless, MLB considered Zone Evaluation an upgrade due in part to ZE's ability to identify trends and tendencies (e.g., Umpire A tends to call lower outside corner curveballs to left-handed hitters as strikes at a rate greater than league average). Furthermore, Sportvision's PITCHf/x was installed in all 30 MLB stadiums, a tremendous upgrade from QuesTec's 11. 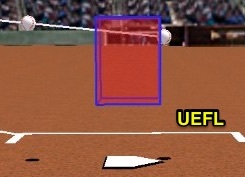 Sportvision claimed that data from the triangulated camera system employed by PITCHf/x would allow the strike zone computer to easily calculate whether a pitch was a strike or a ball. Statcast: In 2017, MLBAM first transitioned from Sportvision Pitch f/x to StatCast, two systems so seemingly similar to the outside observer that the corresponding UEFL rules change stated, "...Pitch f/x, or Statcast, whose titles shall herein be used interchangeably..."
Related Post: 2017 UEFL Rules Summit Discussion (11/11/17). As Pitch f/x had done to QuesTec, Statcast's PITCHcast component introduced several new variables, such as Statcast's new way to measure official pitch speed, start_speed (maximum velocity). Under Pitch f/x, the official speed had been measured at 55 feet from home plate. This led to numerous pitch speed discrepancies between 2016 data (Pitch f/x) and 2017 data (Statcast). 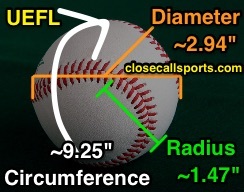 Gil's Call: Although Statcast and PITCHcast are technologically different than PITCHf/x, it appears—from an outsider's perspective—that PITCHcast most certainly derives from PITCHf/x. The question then becomes whether this derivation (or derivative function) infringes upon SMT/Sportvision's patents related to PITCHf/x. Maybe it is time to move on from Pitch f/x. Without getting too bogged down in the patent details, it appears that there is a chance that infringement has occurred. It may be a tad more difficult to discern, discover, or prove whether an actual intellectual property theft has occurred, but it appears that PITCHcast and PITCHf/x are so similar that the patent issue is worth further exploration. In regards to breach of contract, it would appear that MLBAM tried to get out of its relationship with Sportvision and SMT, and that's where an inconsistency arises for me. If MLBAM's argument, as alleged by SMT, is that MLBAM has kept its contractual obligations to PITCHf/x through use of its PITCHcast system, then, logically, one would likely surmise that PITCHcast is PITCHf/x (since MLBAM now uses PITCHcast and the contract allegedly requires MLBAM to use PITCHf/x through 2019). If PITCHcast is PITCHf/x, however, then the charges of patent infringement and intellectual property theft become bolstered. In the end, it sure sounds as if SMT is upset that MLBAM allegedly poached Sportvision's former VP, and that SMT is pretty certain that this ex-employee carried trade secrets to MLBAM, where his information was purportedly welcomed with open arms. This suit could be a real mess going forward, as MLBAM recently received an extension to June for a response to SMT/Sportvision's complaint filing. COUNTERPOINT: One thing in the complaint I categorically disagree with is SMT's claim in paragraph 74 that, "Sportvision's K-Zone system has had a positive impact on MLB viewership. ESPN's adoption and use of K-Zone has been very good for baseball in general and for MLB specifically." If that's the way SMT feels about ESPN's K-Zone and related graphics, then I must agree with MLBAM that it is time to move on from PITCHf/x. Actually, SMT's complaint makes several additional bloated claims, such as "The PITCHf/x System enjoys a hard-earned reputation in every corner of the baseball community as a trusted generator of accurate MLB pitch path and strike zone data. The PITCHf/x System earned this reputation through flawless execution and the accurate tracking of over 10 million pitches over the course of nine (9) full MLB seasons." 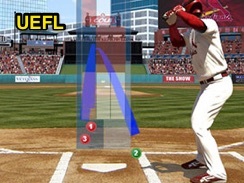 Gameday 2013: Pitch f/x is not at all perfect. Not for nothing, Pitch f/x has hardly experienced "flawless execution" and has not accurately tracked every single of its purported 10 million pitches. Its method of calculating strike zone height (sz_bot, sz_top) is anything but foolproof, and subject to measurement error if for no other reason than Pitch f/x, nearly from its zone height inception, has relied on using the same sz_bot and sz_top numbers throughout an entire at-bat—and often, throughout an entire game, series, or season, on an batter-by-batter basis. In 2013, PITCHf/x outright failed to track 892 of the 709,917 pitches thrown that season. That's not "flawless execution," and the 892 failures are pitches unseen by the system: this number doesn't even include inaccurate calls by the system...just those with no call whatsoever because the system completely failed to register the pitches' existence. Then there's calibration and measurement error: for instance, 2009 Dodger Stadium was consistently wrong by 1.9 inches while 2010 Miller Park was off by 1.7 inches. A baseball's spherical shape also poses issues. Pitch f/x is far from perfect—and that's the whole point of why the human element still exists. The technology simply is not there and to pretend it is comes across as significantly irresponsible. Yes, it can help with some pitches, but the tech isn't there to determine which pitches are and are not accurate in real time. That requires a hefty dose of after-the-fact processing and analysis, and explains why certain allowances, such as margin-of-error (MOE) and radius-of-a-baseball (RAD) values, exist. As we've discussed time and time again, television strike zone graphics such as K-Zone are terrible for the average fan and the related functions of raw data visualization derived by entities such as Brooks Baseball, although fantastic for identifying trends ("consistency"-focus), are damaging when used by those who do not understand the underlying system to cherry pick individual pitches absent a greater context. Illustration of QuesTec's best fit 3D model. And remember, as always, this is a two-dimensional representation of a 3D strike zone, which carries its own voluminous complications. 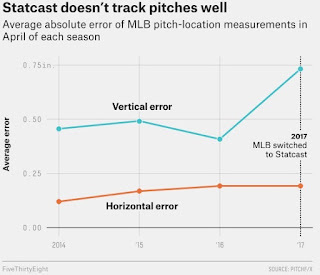 If pitch f/x error continues to promote umpire-blaming (and the recent trend toward player-based umpire complaints suggests it is), then a focus on improving technology is absolutely vital to reduce the possibility of these errors infecting objective data that is portrayed as accurate. On the other hand, when this data suggests that umpires are accurate and players still insist on complaining, it becomes apparent that no matter the technology—Sportvision's or MLBAM's—the blame game still remains a fashionable option for those who wish to willfully remain ignorant of reality...and even a 100% accurate computerized system won't change that. Related Post: Analysis - Catching Up With Todd Frazier 5 Days Later (5/7/18).